Announcement Thanks for visiting my shop. 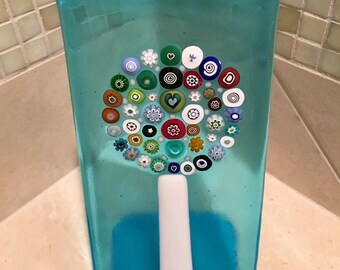 I've been a glass artist for 25+ years. Making fun and functional pieces in my south Florida home has been my creative passion. Etsy listings are just a fraction of the things I've created, ranging from wall art and dimensional pieces to large bowls, dishes, tabletop art, pet portraits and jewelry. I sold my large kiln, equipment and molds recently, so I can only fuse small things now. 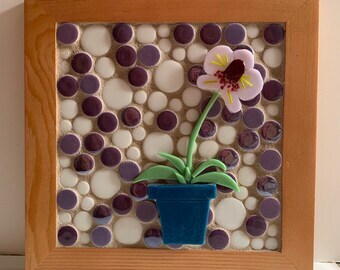 I'm dabbling in mosaic glass art again and art resin/ceramic/glass multi media projects. 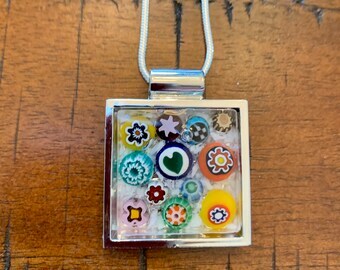 I also work with Italian glass and love to use millefiore. These slices of hand-blown glass rods have been made in Murano Venice for centuries and have delightful internal designs of flowers, hearts, stars, cogs and bullseyes. I sell slices of Italian and American-made millefiore and murrini to other glass artists as well. I'm delighted to have made my 600th sale---thank you glass lovers and friends! Thanks for visiting my shop. I've been a glass artist for 25+ years. Making fun and functional pieces in my south Florida home has been my creative passion. Etsy listings are just a fraction of the things I've created, ranging from wall art and dimensional pieces to large bowls, dishes, tabletop art, pet portraits and jewelry. Brushed metal palm tree display stand. Ocean/sand/sea grass scene with 3 layers of glass and flameworked stringer. Brushed metal frame 12 x 12 with 2-layer glass panel. Mermaid has flameworked hair, dichroic starfish and murrini. An underwater scene with colorful sea fans, sea coral, anemone and dichroic glass fish. A large glass vessel or bowl designed to resemble branch coral in creamy opaque glass with irid blue and green tips. Brushed metal egret/heron tabletop art made by a colleague, paired with a sunset scene in glass with blades of grass. Fun and functional glass, handmade and kiln-formed. Fusible glass comes in sheets, pulverized and powdered, rods, stringer and even 'noodles'. Fusing refers to creating an object with multiple layers or elements of glass and a design unique to the artist, then firing it in a kiln. Glass can be further manipulated by 'bending', polishing, casting, sandblasting and/or slumping it and fusing it multiple times. Each piece is one of a kind and handmade by me. (small): candle holders, night lights, ornaments and pendants. (large): wall art, tabletop art, bowls, dishes, mixed media art, and custom work. 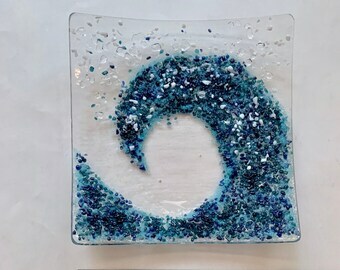 Most of my pieces follow an ocean, beach or sea theme. Seascapes include shorelines, sunsets, sailboats, beach scenes, palm trees and more. I use top of the line American glass from Bullseye, Spectrum, Uroboros, Wasser and several dichroic glass makers. 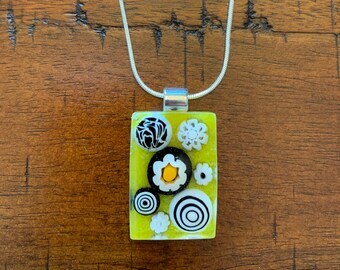 I also use Italian (Murano) sheet glass and millefiore. Thanks for looking in on my store. If you want a variation of something you see listed or multiple of an item, let me know. If I can do it, I'll be happy to. I've satisfied lots of special requests over the years. I strive for 100% customer satisfaction. If you are not completely satisfied with your glass art and want to return it within 7 days of receiving it, I will refund your purchase price, less postage, if the glass is returned in original condition, with delivery confirmation to me in the original box. No worries. Through Direct Checkout, I accept most major credit cards, ApplePay and Paypal. I ship within 2 days of payment, unless it is a custom order. In that case, we will agree on the timeframe at the time the order is paid for. Within the US, I generally use USPS first class with delivery confirmation and tracking for packages weighing 13 oz or less and Priority Mail for things weighing more. If you prefer UPS or FedEx, I can do that and recalculate shipping fees for you. Postal insurance is recommended but optional for packages under 13 oz if art glass is the purchase. I pack with great care and use good packaging, foam peanuts and bubble wrap. If you forego insurance, loss or damage is your risk.